The PIP with the Panel-6 option is a highly integrated robust packaged industrial PC with a special designed aluminum housing and an integrated TFT display. The PIP housing offers enough space to integrate hard disk and/or Flash disk, floppy and any PC/104 extensions. The PIP product range offers next to the standard PC functionality on-board special industrial features like 4x RS232 (RS485), USB, Ethernet, and Firewire (depending on selected model). 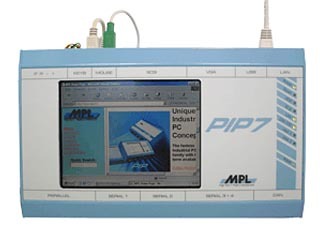 The PIP product range is available with various processor technologies up to Intel Core 2 Duo. The special low power consumption design from MPL allows to operate the PIP family without fan or ventilation holes. Unique is also that the PIP products can be operated with 8 - 28VDC/48VDC. With the PIP product range there is no need for internal cabling as all is connected and ready for the customer. The PIP product is a unique industrial solution with a great flexibility to help to reduce the overall cost in your projects. The Panel & Touch option gives the PIP product range additional functionality on very small space. The integrated panel is a TFT display with 6.3"-XGA resolution. The panel supports the design efforts of low power consumption. It offers excellent readability and brightness as required in industrial applications. The panel is protected with a hard coated and non-glaring glass. If the application requires a Touch screen solution then this can also be integrated in the product without special wiring. The Touch screen surface is specially hard coated and has the non-glare feature too. The input can be done by hand or with a pen. Width the touch-6 option, a resistive touch screen is offered. Standard 82.5mm high aluminum PIP-housing (internally chromated, externally powder coated), capable to incorporated a 6" TFT display, a Touch screen, any PIP board including HDD/Flash, RAM and expansion possibility of one PC/104 or one PC/104-Plus card. Standard 120mm high aluminum PIP-housing (internally chromated, externally powder coated), capable to incorporated a 6" TFT display, a Touch screen, any PIP board including HDD/Flash, RAM and expansion possibility of up to three PC/104 or PC/104-Plus cards.